Thanks. The basics are great, and we can do some easy add-ins if we want, such as chopped nuts and fruit (apples or cranberries). Burned muffins are real, and I appreciate you! Good job! These sound great! I can’t wait to try them!!!! 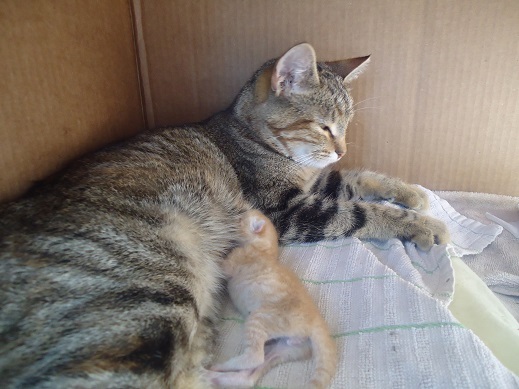 God Bless you for helping that kitten..I enjoy your blog very much & have for some time. Thank You for wonderful ideas & for sharing! I never make stuffing either – I’m not a fan. My husband will love these muffins. I have made stuffing a few times and love, how simple you have made your recipe I think I might give it a try! The stuffing sounds great. 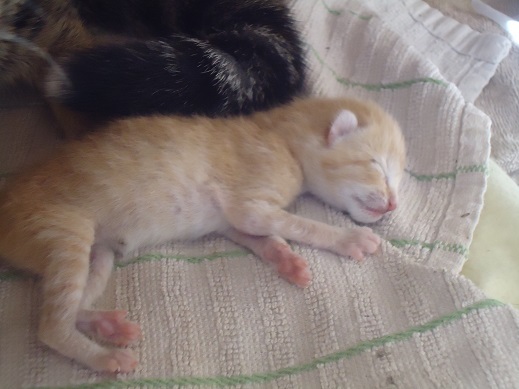 The kitten is adorable! These look good, but I think I will have to stick with our traditional family recipe so there’s no mutiny. :) Good idea to make it as muffins though! p.s. Lionel is so cute!! Thank God for you! Finally, someone else who does not like celery and does not do everything perfectly every time. Thank you, thank you, thank you for sharing all of your real lifeness (look there, a made-up word :)). The recipe aside, I just want to thank you for kicking up a memory….My mom always used to pick up whichever little cutie pie toddled her way and tell him/her that they were the “stuffin’ in the muffin” as she kissed the heck out of their chubby baby cheeks. I think I need to try this recipe just for something different…but I think I’ll add Celery or Celery seed. Maybe this will inspire me to tweak my own recipe. I will be making a large amount of sourdough stuffing muffins for the freezer! I see an easy side item to throw into my boys work lunches that will be easy for themto eat and filling with the added bonus of extra protein from the sausage as they have very physical jobs! Thank you for this idea!!!! 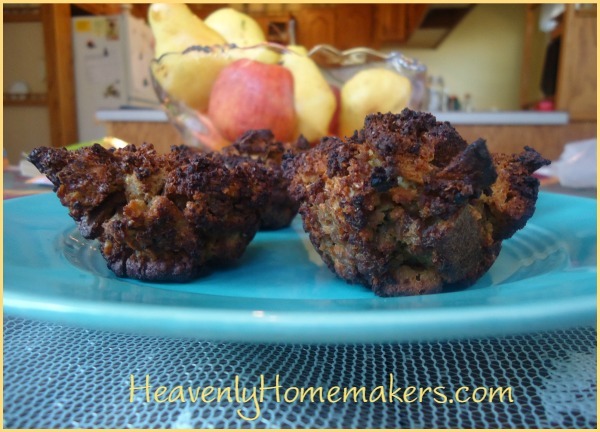 I was intrigued when I saw stuffing muffins listed on your meal plan and now I can’t wait to try these! Yum! Your kitten is adorable! That looks easy enough I might not mess it up!! Lol! Thanks! I love stuffing but my family isn’t big on it. My husband loves muffins. This just might take care of things. At least it will make it easier to portion out a little bit for me at a time. Glad things are working out for the one kitten. So sorry about the others. Thank you for sharing Wiggams story too. Such sweet kitties. You did a great job helping Wiggams. Love the much easier stuffing recipe! Thanks for the recipe and freezing tip! This will come in handy, even if the crowd is just my three “boys” and me. (Hubby, J, and my brother) And that baby kitten is darling! May Lionel continue growing bigger and stronger. 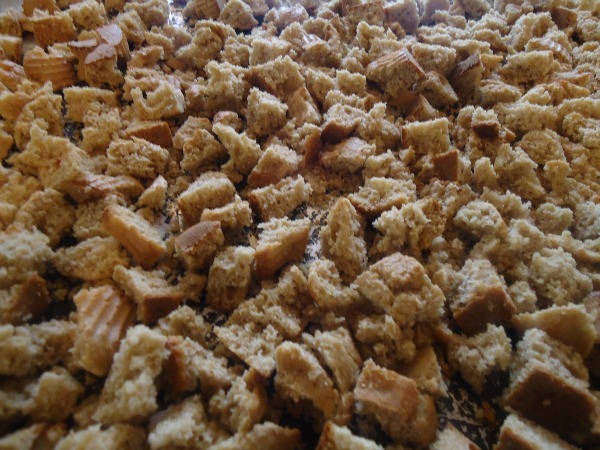 To make your stuffing even easier – cube the bread and let it set out overnight. No need to taste it ???? That should say no need to toast it – auto correct – ugh. I can’t wait to try this. I’m a huge fan of stuffing!!!!!! My family will love these. Thanks! What a great idea! I love that you can freeze. 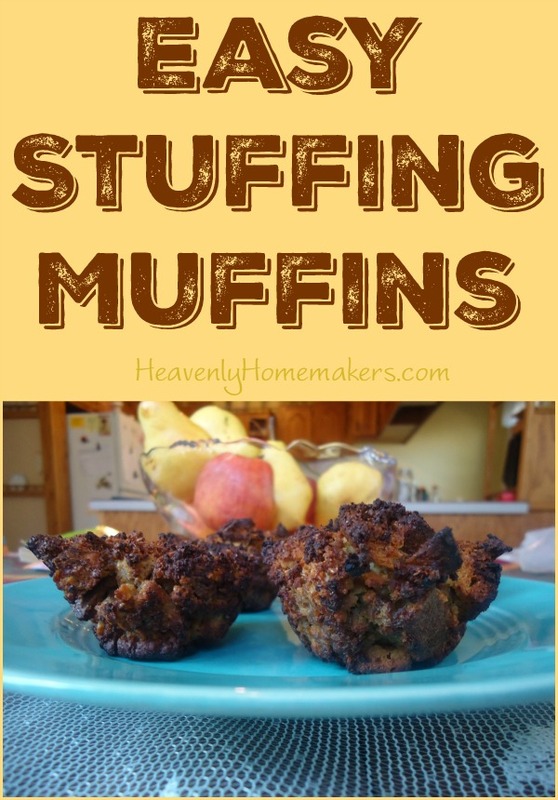 Love the idea of doing the stuffing as muffins! Genius! Laura, I, too have often avoided making stuffing, letting someone else make it or going without, but this recipe looks both yummy and doable. Thank you! Can’t wait to try the stuffing. In going to add cornbread and celery to mine. With a recipe like this, I think we will be having stuffing year round and not just on Thanksgiving! Thank you! Thanks so much for this recipe! My husband and I host a weekly college Bible study at our house, and I always cook a big Thanksgiving feast for them all. I love this make-ahead series!! It will make prepping so much easier! I’m glad you are a real person that burns muffins while saving lives! That’s why I read this blog! I love the idea of go-ahead stuffing! One less thing to distract me from watching the parade???? I love this idea! I’m thinking I could try it with the copious amounts of leftover stuffing that we always seem to have after thanksgiving! I think it would be great to have small portions ready in the freezer. Thanks for the idea! Great idea! Our family doesn’t like celery either. I will have to try your recipe. 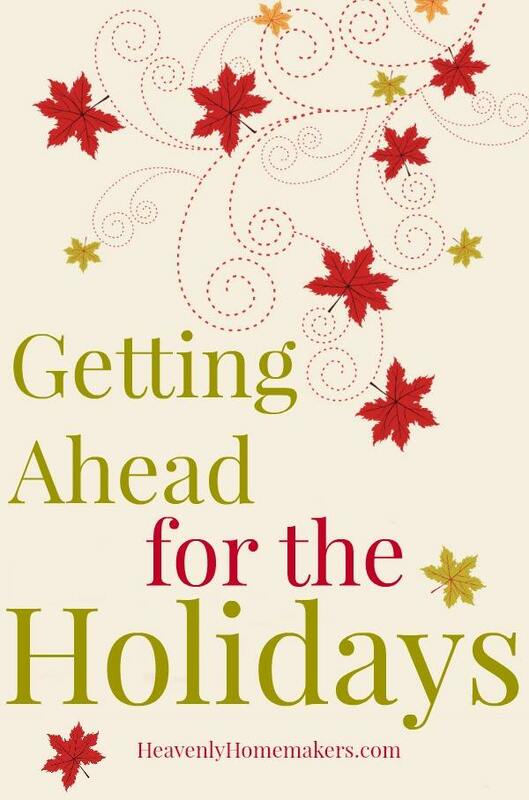 Looks like I can use this recipe not only at holidays, but other times of the year too! Your recipe came at the perfect time! As we recently found out one of our boys is deathly allergic to celery! I am excited to try these for Thanksgiving! How might you modify the cooking time or recipe if you used a 9×13 pan or crock pot? Sounds yummy – can’t wait to try! OOOh, I can’t wait to try these! Thank you once again for all the ways you share to save time in cooking!!!! Burnt muffins in pursuit of keeping a kitten alive seems like a good trade-off to me! Cant’ wait to try these. I adore stuffing!!!! Since I don’t make it often, stuffing is my favorite part of the Thanksgiving meal. Thank you for sharing. This recipe doesn’t seem to daunting. I have a question… I just put the stuffing in ziploc bag in the freezer and will put it in a 9×13 pan to save space in my freezer and take out to thaw and bake on Thanksgiving Day. Then i noticed that you baked them before freezing. Do you think this will work? Yes, I think your plan will work just fine!